Ohm Force has announced the imminent release of its latest creation, Ohmicide:Melohman, in February. Based on Predatohm's design, Ohmicide:Melohman is organized around up to four frequency bands, each of them coming with their own Noise Gate, Dynamic, Distortion, Feedback Generator and all mixing abilities with just a twist of pre- and post-processing (distort input, high shelf output...). But the DSP is 100% different from Predatohm: the compressor/expander works differently to fit well with both the very sharp Noise Gate and the huge amount of new distortions which are declined in three variations: normal, ampsim and odd. The "Odd" one gives you control over the harmonics frequency and allows for slightly detuned distortion. Last but not least, Ohm Force has added a disto type that was missing from Predatohm... No distortion. It was an absolute need, considering how many things can be done just by using the multiband dynamics! And Predatohm addicts will be happy to know that not only does Ohmicide:Melohman include a feedback generator on each band, but that it can be spread in stereo. 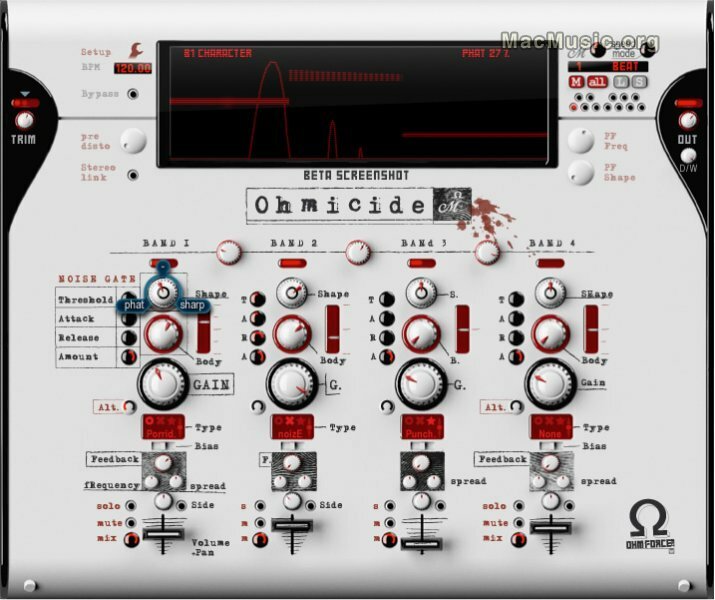 Ohmicide:Melohman will be released in February 2007 for Mac OS X Universal Binaries (VST, AU, RTAS). Shipping is exclusively via download on Ohm Force 's web site. There are two license options: Single License version for €79 (includes a single platform only but the customer gets to choose it) and Pack version for €99 (includes all platforms... even future ones).